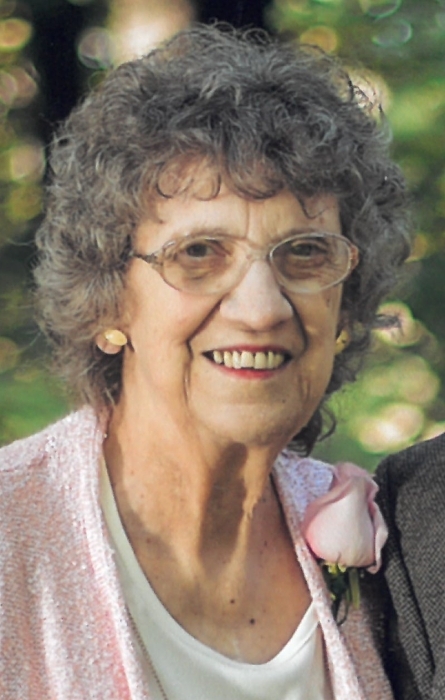 Irma R. Rathbun, 86, died Saturday, July 21, 2018, at Mayo Clinic Hospital Methodist Campus in Rochester, MN. A visitation will be held from 5-7 p.m. on Tuesday, July 24, 2018, at Our Savior’s Lutheran Church in Spring Valley, and will continue one hour prior to service on Wednesday. The funeral service will be held at 11:00 a.m. at Our Savior’s Lutheran Church on Wednesday, July 25, 2018. Hindt Funeral Home Spring Valley is in charge of arrangements. Irma Ruth Buss was born on October 2, 1931, in Spring Valley, MN, daughter of Ervin and Ruth (Bolan) Buss. She was a 1949 graduate of Spring Valley High School. During high school Irma was hired as a bank teller for Home Federal. On Sunday, September 14, 1952, Irma married Lawrence “Mick” Rathbun in the high school gymnasium as Our Savior’s was in the process of being built. She played for the church service in the morning and was married that afternoon. After a 40 year career at Home Federal, Irma retired in 1988. She became the first woman on the Home Federal Bank board, and served for 12 years. Irma was also on the Spring Valley Cemetery and hospital board. She was given the award of Kiwanis Citizen of the Year in 1994. She continued as church organist until early 2000s, but still volunteered her time for weddings and funerals. Irma loved attending her grandchildren’s sporting events. She was encouraged to keep book during the games, because she was known to get on the Refs for “bad calls” against her grandchildren. Irma enjoyed traveling with Mick but never during their grandchildren’s sporting seasons, going on bus trips, and traveling with the Home Federal Bank board. She liked working on word puzzles and baking. She often shared her goodies with family, friends, and neighbors. Irma was proud to be a part of the Spring Valley Community her entire life. Irma is survived by her husband of 65 years Lawernce “Mick” Rathbun of Spring Valley, MN; 2 sons Greg (Kathy) Rathbun of Byron, MN, and Rick (Sue) Rathbun of Rochester, MN; 5 grandchildren Jon (Jenny) Rathbun of Chanhassen, MN, Jeff (Molly) Rathbun of Woodbury, MN, Brittany (Jay) Ellerbusch of Dundas, MN, Jason (Heather) Rathbun of Kasson, MN, Marissa (Ryan) Pietsch of Farmington, MN; 8 great grandchildren Ellyce, Jon Thomas, Joey, Lucy, Jackson, Kinsley, Aubrey, and Cecilia; and her brother-in-law Aaron Klompenhower. She is preceded in death by her parents, and sisters Virginia (Bob) Klompenhower and Janet Klompenhower. Memorials on behalf of Irma Rathbun may be given to Mayo Hospice or Our Saviors Lutheran Church.